There was a time when the light of La Madeleine, a popular suburb of Évreux, in Normandy, was caused by setting cars on fire. Days in which the area was bordered by barricades, police persecution and violent situations. The death of two young people of African descent, when they fled the police on October 27, 2005 in Clichy-sous-Bois on the periphery of Paris, was the fuse that lit the bonfires in much of the country. The humblest France, daughter of immigration, had raised her voice to claim the hardness of life in some neighbourhoods, often despised as ghettos. They were difficult days on the streets of Madeleine, the same streets where Ousmane Dembélé began kicking a ball. His mother, Fatimata, of Mauritanian blood, had settled in the area with Barça’s new player and his siblings: another boy and two girls. "Growing up in a neighbourhood like that, it’s hard. You need character and it forces you to win respect," Mikael Silvestre confirmed to L'Équipe, the former player influential in taking Dembélé to Rennes. "Madeleine is a tough place, a popular neighbourhood of Frenchmen with African roots," describes Ahmed Wahbi, who, walking between buildings, saw young Dembélé for the first time. "Ousmane was six years old, I was playing with some friends and I saw him kick the ball, his technique... I asked him to come to the club where I was training, ALM Évreux. I remember that the first thing he asked me was if he would have a football kit and if there would be a referee… he was seduced by that." France were World Cup winners in 1998 at Saint Denis. "We always understood diversity as a wealth. It generated controversy but we ended the tournament brilliantly. Each inhabitant could be seen reflected in one player or another, " said Christian Karembeu, a member of that golden generation. Players like Didier Deschamps, Fabien Barthez and Laurent Blanc fought alongside children of immigration; Zinedine Zidane, Liliam Thuram and Thierry Henry, for the same cause. Dembélé was barely a year old when the trophy was held aloft in Paris, and many considered that this was more than football; It was the union between the different parts of a global country and the demonstration that, even in the most difficult areas, where prosperity implies day-by-day non-negotiable sweat, there was also room for dreamers. The ball equalises us all and in the peripheries of the main French cities it acted as an integrating vehicle. For Ousmane, it was his life. "It has all happened very quickly. I still remember when I got to the training sessions: two per week between six and eight years old and, thereafter, three," Wahbi continues. "He was a disciplined boy, very aware of his mother, but sometimes she called me because he had not returned home from training. It turned out that he stayed in the street to continue playing with his friends." It's been a short decade since those football evenings and Dembélé has transferred from the streets of La Madeleine to the Camp Nou with the same determination. He would often visualise his dream, hoping he would one day fulfill it. "It was the time of the great Barça: Xavi, Iniesta... and, of course, Messi, players he loved. We wore a Barça kit habitually and in training we tried to copy their style. “I used to tell them that they had to train a lot to reach that level," added Ahmed Wahbi. 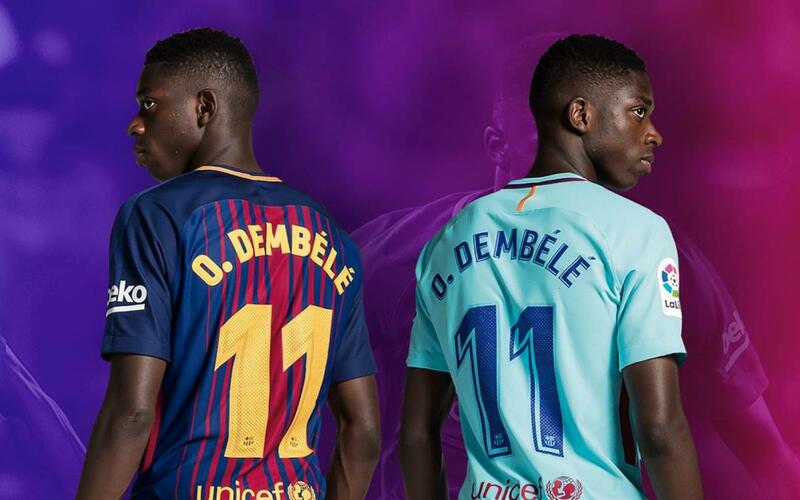 For Dembélé however, a pure talent, it was perhaps only a matter of time. He drew the attention of important clubs in the area: Caen, Le Havre, Rennes and even PSG. He had everything agreed with Le Havre, a breeding ground for some of the latest French football talents such as Paul Pogba, Riyad Mahrez and Dimitri Payet, but at age 13 he eventually moved to Rennes. "The first time I saw him was over a period of three or four days. We were all coaches from Rennes training centre and our impression was unanimous: he was very good. He already had this unique ability although he hadn’t yet developed the speed he has now," said Yannick Menu, who helped with much of Ousmane's development in the Breton capital, first as his coach and later as a director of youth football. “He enjoyed playing and he had the skill of a street player. “His mother explained to me that since he was a child he always had a ball at his feet, wherever he was. When she took it away, he began to cry," explained Menu, who became his mentor. "His ability was achieved by playing in the street, where the ground is not even and is full of obstacles," Wahbi agreed. Capable of almost anything on the football pitch, Dembélé advanced as fast as he was allowed. "There was a time when he clashed with the club: He thought that he was ready to train with the professionals and I didn’t," said Menu. But, despite the hesitation, on September 6, 2015, against Angers, Dembélé donned the Rennes shirt for the first time. The rest is history. A hat-trick in the derby against Nantes, a great performance at the majestic Marseille Velodrome and a handful of good games garnered the full attention of the football world. His decision was to move to Dortmund. "He was very clear at all times, he wanted an intermediate club to play for, although Barcelona was always in his head," Menu continued. Dembélé had the personality to wait, to choose a longer path and to take the train two stations further on. The Westfalenstadion and their yellow wall, the Südtribune, were in his thrall, spurred on by a footballer who was always challenging, unpredictable and good on both the left and right side. In no time at all, however, Dembélé has closed the circle. He has managed to fulfil the dream of all his teammates at ALM Évreux and wear the Blaugrana again. Only this time, he stands alongside Leo Messi for real, as a teammate. Such a path has only been interrupted by an untimely injury. "Ousmane is strong, and he will return with more strength because he is a boy with great character," Menu noted. "It's where he always wanted to be and with people he admires. He will surpass all expectations,” warned Ahmed Wahbi, who knows the path Dembélé has trodden; from the streets of Madeleine to the Camp Nou. He would finally join FC Barcelona last summer, and despite an injury curtailing his adaptation at the end of last year, he is ready to shine in 2018. After his rise from La Madeleine to the Camp Nou, few would bet against him.